At Beit Issie Shapiro, we believe that every child should have the opportunity to enjoy Purim, and to plan their costume and dress up as they wish. However, children with disabilities who use wheelchairs and walkers, often find Purim challenging because it’s difficult for them to dress up and experience the joy and excitement of doing so. In order to afford children with disabilities this opportunity, and help realize their dreams, Beit Issie Shapiro partners with HIT, the Holon Institute of Technology, and students from their industrial design department. 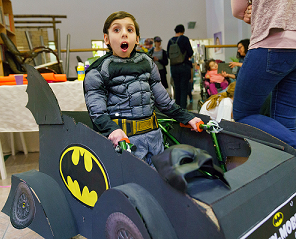 Around 30 children with disabilities register for the “Purim Dreams Costume Celebration” held at Beit Issie Shapiro each year. Two weeks before Purim, The HIT students come to Beit Issie Shapiro where they are paired with a child with disabilities and their family. 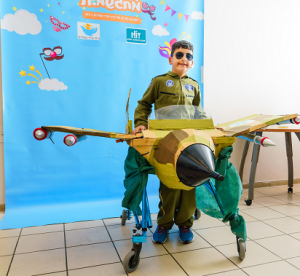 Together they design a Purim costume that incorporates the child’s wheelchair or walker which becomes an integral part of the child’s costume, rather than something that needs to be hidden. The HIT students then have about ten days to work on the costumes. A few days before Purim, the children, families and students return to Beit Issie Shapiro and the excitement is palpable. The students bring the costumes they have worked on and, together with the children and their families, they complete the final touches. There is then a colorful Purim Dreams Costume Celebration where the children have the chance to parade their costumes in front of their families and the HIT students. 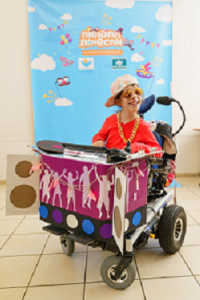 The Project, which is entering its fourth year, has allowed children with disabilities to realize their dreams and enjoy the festival of Purim to its fullest. It has also led to the creation of incredible Purim costumes. For example, Roni, who wanted to dress up as a DJ, had her wheelchair transformed into a DJ turntable; Neria, who dreams of being a pilot, had his walker turned into a fighter jet for the day, and Bryan, who loves Batman, had his wheelchair converted into the Batmobile. Other costumes children have chosen over the years include a Coke bottle, Iron Man, and SpongeBob. 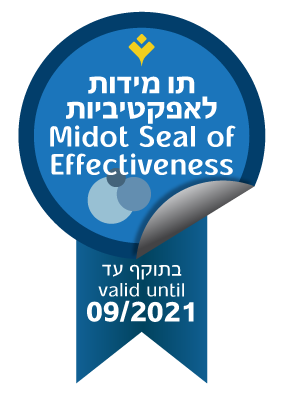 We are delighted to share this with you to ensure that children with disabilities all over the world can not only join, but also lead, the party on Purim.